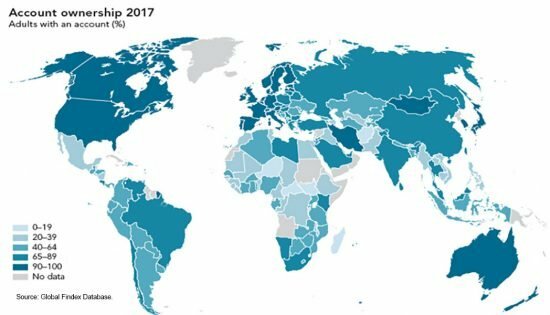 Globally, financial inclusion is on the rise: 515 million adults have gained access to financial services since 2014, a seven percent increase in three years. The share of adults with an account now stands at 69 percent. Digital financial services are a big part of the story, especially in sub-Saharan Africa, where the share of adults with a mobile money account has more than doubled, currently standing at 21 percent. Digging into the details, however, we see some persistent gaps, and reasons to be sanguine about the impact of digital financial services. Around the world, 1.7 billion adults remain financially excluded, down from two billion in 2014. FINCA is right in the center of this struggle: nearly a quarter of the world’s unbanked people live in the countries where we operate. The gap is especially wide in places like Pakistan, Afghanistan and the Democratic Republic of Congo, where nearly four out of five adults are financially excluded. Fifty-six percent of the unbanked population, or 980 million people, are women, and the gender gap has barely changed since 2011. In the 20 countries where FINCA works, 75 percent of women lack access to an account. Three years ago, it was 79 percent. The poor also face additional hurdles. Looking at countries where FINCA operates, financial exclusion still affects 76 percent of the poorest people. This is an improvement of five percentage points from 2014, but still a long way from our goal of universal access. Strong progress has been made in some surprising corners, including in countries where FINCA is working. The share of excluded people in Tajikistan, for example, has dropped from 89 percent to 53 percent. Armenia, Georgia and Kyrgyzstan have also made substantial gains, increasing the share of financially included adults by 30, 22 and 21 percentage points, respectively. Sub-Saharan Africa is the epicenter of digital financial inclusion. In FINCA countries, progress is mobile money accounts is evident. Excluding Nigeria (which actually slipped backwards in the last three years), the share of adults using mobile money has grown from 20 to 30 percent of the adult population. Account ownership at a financial institution with formal savings and credit options, however, has grown at a much slower pace. In the African markets where FINCA works, account ownership at a financial institution has only increased from 18 to 22 percent. Again, women and the poor continue to have higher rates of exclusion: 86 percent of those at the bottom still lacked a financial institution account in 2017. This represents some improvement over 2014, when it stood at 90 percent, but there is a still a great need to bring these services to those who need them most. Digital financial services make it easier for people to send and receive money. This can help customers optimize their cash flow, recover from a setback or make an investment. But these payment platforms are not yet impacting savings behavior on a global scale. Only 27 percent of adults around the world used formal savings services in 2017, which is the exact same level as 2014. So, while the business case for service providers is strong in payments and money transfers, the impact on actual banking services—such as savings—is less clear. As a mission-driven organization, FINCA does not shy away from challenges. The 2017 Global Findex shows us that progress is possible. It also inspires us to redouble our efforts to reach those who are persistently unbanked, especially women and the poor, and to deliver services that improve their financial condition in meaningful ways.